If you played Destiny anytime in the last 24 hours, you found a surprise waiting for you in the Tower. The Queen’s Wrath is back! The back promenade in the Tower has reopened, and look who it is! It’s good ol’ Petra Venj, the Queen’s Wrath bounty lady. She’s arrived in advance of the House of Wolves expansion, which launches this coming Tuesday, and she’s got some new bounties for everyone. 1. Go to the tower and pick up the available bounties from Petra Venj. Each one looks like an actual bounty this time, with the name of a target and their outline. A new bounty opens up each day; there are already five of them available: Two on Earth, two on Venus, and one on the Moon. The last Moon one unlocks tomorrow. Nifty. 2. While picking up your bounty from Petra, say her name out loud. Notice that it sounds like you’re saying “Pet Revenge.” Lol softly to yourself. 3. Head to whatever region the bounty you’re pursuing dictates, and wait. In a few minutes, you’ll see some notification text that says “A pack of Wolves is prowling.” That means it’s go time. 4. Fight off the waves of attacking Fallen. Eventually, the mini-boss on your bounty appears. The enemies are all high level, so they can be pretty tough. Fortunately, there’ll be a lot of people at a given battle, since everyone is doing these pretty much constantly. In the chest, you’ll get some crafting materials, some blue or purple engrams, or even—apparently—a key to open a chest in the Prison of Elders, the new horde mode that comes with House of Wolves. I’ve gotten a bunch of blue and one purple engram, but no chest keys yet. I’ve taken down a bunch of the bounties across my three alts. Here are a few tips to keep in mind as you go. Bring your Arc guns. These being Fallen enemies, a lot of them have arc shields, and it can take a stupid amount of non-arc gunfire to bring them down. Hooray Fatebringer! Hooray Song of Ir Yut! 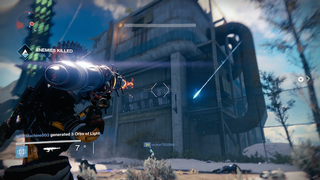 Each encounter will start with a couple of enemies carrying the new Scorcher Cannon. Kill these dudes, and you can use the cannon yourself. They’re fun, and you’ll probably want to grab the first one you see and start wasting enemies with it. Resist the temptation and save your ammo for the boss. Scorcher Cannons are really powerful, but they have a limited number of rounds, so don’t waste them on enemies the other players could take out normally. No one likes the rookie who shows up and starts wasting precious scorcher rounds on scrubs. Enemies can no longer be damaged while they’re hanging from dropships. If you’ve defended a warsat or fifty in your time as a guardian, you’ll know that’s a minor game-changer. No more firing rockets to clear out a bunch of dudes before they even hit the ground. You’ll have to fight them straight-up. Time is a factor. If you take too long to beat one of the bosses, they’ll lose interest in the fight and bail. Be sure everyone is focusing fire at once. Jason and I let a boss slip through our fingers, and it was a bummer. Once you defeat the bounty boss, keep an eye on everyone else you were fighting alongside. That can be the easiest way to find the chest. You don’t actually need a bounty to get the chest; you can just go and kill the bosses on your own to get ether keys. It sounds like it’s possible to loot each chest more than once. Once you’ve opened a chest, quickly hop on your sparrow and travel to an adjoining region. Check your Ghost to make sure you’ve left the original area, then quickly double back and raid the chest again. I haven’t gotten this to work yet, but a few commenters are reporting that it’s doable. Nice. And that’s pretty much all I got. The folks at the Destiny subreddit have been collecting a thorough list of all the other new stuff in the expansion that I haven’t had a chance to check out. Sounds like there’s a new Fallen Pike that packs a mean punch, in addition to some other things. A bunch of people have also been hard at work mapping the locations of the potential ether chest locations. If you’ve got any other tips, I hope you’ll share below. It’s pretty nice to have a new thing to do in Destiny, huh? Tuesday should be fun.